Ba: What do you want to eat? Grandma: I don't care. I'll eat anything. Afram: Get something with mushrooms or broccoli. Grandma: (laughing because she hates mushrooms and broccoli) He knows me too well! Ba: You gotta pick something. Ba: They don't have I don't care on the menu! 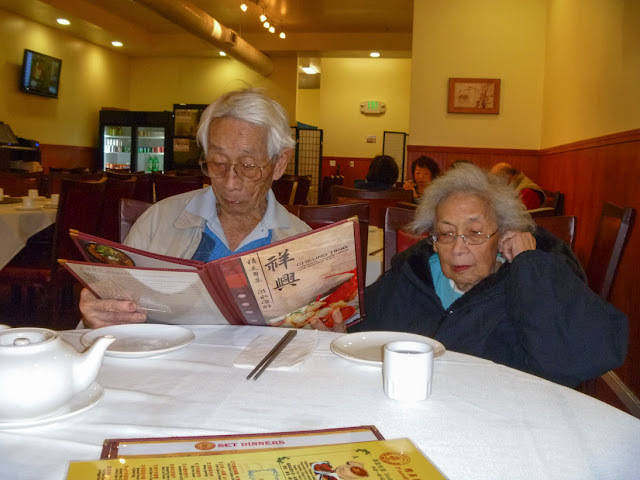 Grandma: (looking at the menu) Okay... I want... the "I don't care." I called my grandparents at 11:30ish today to remind them to take their pills like I've been doing for the past few weeks. My grandfather said they were just getting out of bed. I asked him if he'd still like to have dinner tonight and he happily agreed. I told him I'd come pick them up at 5:30 and was planning on taking them to Cheung Hing, the new restaurant my mom showed me a couple weeks ago when we all went out together.